Pollyanna is all alone in the world, except for her cold and demanding aunt. And life in the small New England town is very different than in the West where Pollyanna grew up. Aunt Polly isn't used to children...or slammed doors or missed meals or any of the troublesome adventures that Pollyanna gets into. Will she ever accept this unexpected niece of hers, everyone wonders. But Pollyanna has a secret weapon, almost the only thing her father has left her. Soon the whole town will be playing the game that Pollyanna lives by. But will it help Pollyanna herself when her very life hangs in the balance?" 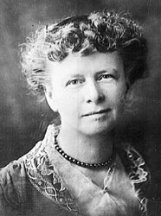 Eleanor H. Porter was born in New Hampshire in 1868. She didn't spend much time in school during her childhood, because her family believed that being outdoors would make her stronger! She loved music. After completing her studies at the New England Conservatory of Music in Boston, she became a choir leader, singer and teacher. When she was 24 years old, Eleanor married John Lyman Porter. They traveled to Tennessee and later settled in New York. Eleanor began to publish books first short stories and then many novels for both adults and children. She sometimes used the pen name of Eleanor Stuart. 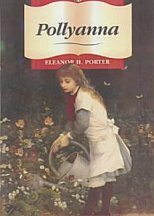 Pollyanna, written in 1913, was Eleanor's most successful book and was widely read in many countries around the world. Eleanor several other books about this little "glad" girl. In 1920, the year that Eleanor Porter died, the first film version of Pollyanna was produced. This story was the basis of a 1920 silent film starring Mary Pickford and the 1960 Walt Disney movie starring Hayley Mills and Jane Wyman. 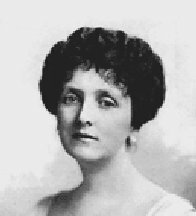 Born in Littleton, New Hampshire, on December 19, 1868, Eleanor Emily Hodgman studied singing at the New England Conservatory of Music in Boston. She gained a local reputation as a singer in concerts and church choirs and continued her singing career after her marriage in 1892 to John L. Porter, a businessman. By 1901, however, she had abandoned music in favor of writing. Her stories began appearing in numerous popular magazines and newspapers, and in 1907 she published her first novel, Cross Currents. 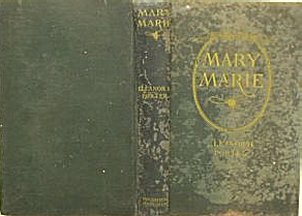 There followed The Turn of the Tide (1908); The Story of Marco (1911); Miss Billy (1911), her first really successful book; and Miss Billy's Decision (1912). 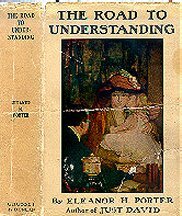 In 1913 Porter published Pollyanna, a sentimental tale of a most improbable heroine, a young girl whose "glad game" of always looking for and finding the bright side of things somehow reforms her antagonists, restores hope to the hopeless, and generally rights the wrongs of the world. The book's immediate and enormous popularity--in countless reprinted editions it eventually sold over a million copies--must be attributed to the American reading public's eagerness for reassurance that rural virtues and cheerful optimism still existed, as well as to Porter's skill in blending dashes of social conscience and ironic distance into the sentimentalism of her message. Pollyanna, second on the fiction best-seller list for 1914, was followed by Pollyanna Grows Up (1915). It also was made into a Broadway play (1916) starring Helen Hayes and then into a motion picture (1920) starring Mary Pickford (a 1960 version starred Hayley Mills), and it inspired a veritable industry for related books and products. "Glad" clubs sprang up around the country and then abroad as Pollyanna was translated into several foreign languages. 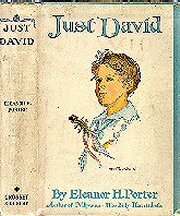 The name itself soon entered the American lexicon, albeit in a largely pejorative sense.Porter's other books include the best-sellers Just David (1916), The Road to Understanding (1917), Oh, Money! Money! (1918), Dawn (1919), and Mary-Marie (1920). Many of her more than 200 stories were collected in Across the Years (1919), The Tie that Binds (1919), and, posthumously, Money, Love and Kate (1925), Little Pardner (1926), and Just Mother (1927). Porter died in Cambridge, Massachusetts, on May 21, 1920. A series of juvenile Pollyanna books was subsequently written by Harriet L. Smith and Elizabeth Borton. 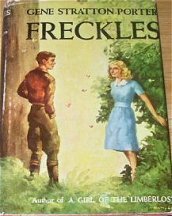 Freckles ~ Doubleday, Page & Co, 1904, 1916. Broken in spirit and body, James Lewis MacFarland, a wounded veteran of World War I, decides to escape from the military hospital before he is sent to a hospital for tubercular patients. He sets out on a great adventure which takes him to the healing sun and ocean of California. Gene Stratton-Porter As one of Indiana’s best-known authors, Gene Stratton-Porter left an indelible mark on the state's history. Her writing started out as a way to make a little extra money, but it eventually made her a world famous author and naturalist. 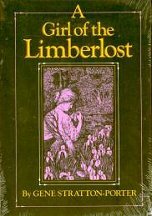 Most people know of Stratton-Porter from her two most famous novels, Freckles and A Girl of the Limberlost. However, many people are unaware that she wrote many of her novels to support her non-fiction writing. "My seven-passenger automobile I transformed into a dray. A big, ten-bushel store box filled the tonneau. 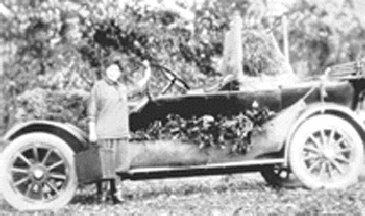 There were long boxes for each of the running boards and frequently I threw coffee sacking over the engine hood and loaded it with swamp mosses and bulbous plants, with pitcher plant and rosemary, as high as I could stack it and allow space for the driver to see over"
From Tales You Won't Believe by Gene Stratton-Porter. Far from being a proscriber of minutiae, Post the philosopher offers a way of living: “Manners are made up of trivialities of deportment which can be easily learned if one does not happen to know them; manner is personality—the outward manifestation of one’s innate character and attitude toward life.” Post gives us thousands of tips on correspondence, wedding planning, party giving and conduct in every public or private setting. Born in Baltimore, Maryland, on October 27, 1872 (some sources give October 3, 1873), Emily Price was educated in private schools in New York City. A popular debutante, she married Edwin M. Post in 1892 (divorced 1906). 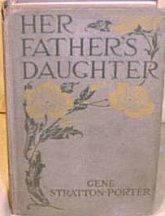 At the turn of the century financial circumstances had compelled her to begin to write, and she produced newspaper articles on architecture and interior decoration, stories and serials for such magazines as Harper's, Scribner's, and the Century, and light novels, including Flight of the Moth (1904), Purple and Fine Linen (1906), Woven in the Tapestry (1908), The Title Market (1909), and The Eagle's Feather (1910). 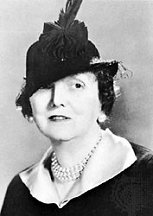 At the request of her publisher Post wrote Etiquette in Society, in Business, in Politics, and at Home in 1922. Immediately popular, the book's charming and lively presentation differed from other guides to manners in being directed to popular audiences. It laid down fundamental rules that remained unchanged through the book's many printings, although Post took care to remain abreast of the times in dealing with broad changes in society. Proper behavior, she believed, was a manifestation of common sense and consideration of other people. Sections of the first edition reflect the period of her own upbringing ("Chaperons and Other Conventions") and were later modified to reflect changing customs ("The Vanishing Chaperon and Other New Conventions"). She added to later editions guides to television, telephone, and airplane etiquette. 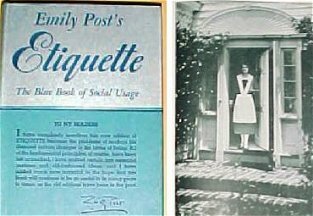 Later retitled Etiquette--the Blue Book of Social Usage, the guide went through 10 editions and 90 printings before her death.After 1931 Post spoke on radio programs and wrote a column on good taste for the Bell Syndicate; it appeared daily in some 200 newspapers after 1932. Her other books include the novel Parade (1925), How to Behave Though a Debutante (1928), The Personality of a House (1930), Children are People (1940), The Emily Post Cook Book (1949; with Edwin M. Post, Jr.), and Motor Manners (1950). Post died in New York, New York, on September 25, 1960. 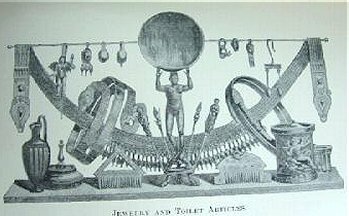 In Barbary, Tunisia, Algeria, Morocco and the Sahara ~ 1926 ~ New York, NY: Century Co.; xxii, 483 p., illustrated. Edward Alexander Powell American War Correspondent and Adventure Writer was born in 1879. His family were horse breeders or ranchers and at an early age he was sent with a consignment of thoroughbred horses to Mexico. Returning by way of Cuba, he was not only struck with a severe case of dysentery, but was also infected with a life-long love of traveling and adventure. Afterwards he started out on a career that would take him all over the world, into some of the most inhospitable and remote regions left on earth, to the battlefields of the Great War and into the company of many of the 20th century’s most important leaders and politicians - Theodore Roosevelt, Albert 1 King of the Belgians, Winston Churchill, Generals Gouraud and Nivelle, Pancho Villa, the Shah of Persia, Marshall von Hindenburg, Marshall Pilsudski, Soviet Marshall Tuckashevsky, Adolf Hitler and many more. He started out on a career of journalism and adventure writing more or less unintentionally. While traveling around Europe before the Great War, his first articles were on horsing and sporting events but almost naturally he slipped into writing travel and adventure pieces and later went on to straight news reporting. As a side profession, he was also employed by the US government in the consular service in the Middle East for a while. 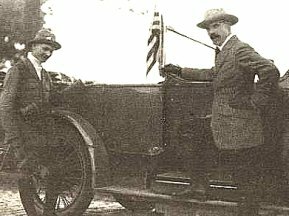 When the Great War broke out in August 1914, he made a proposition to Mr. Charles Lincoln, managing editor of the 'New York World'. He proposed he set off to Belgium to cover the war on his own expense, expecting only to be paid upon producing anything of interest to the newspaper. He was taken up on his proposal, quickly delivered in spades and was paid handsomely for his war-time reporting. Having previously lived in Belgium, he was more or less knowledgeable of the country and decided he had a better chance of doing serious war-reporting there than in France. He was ever so correct. He took up rooms in the Saint Anthoine, Antwerp’s most elegant hotel and at that time residence to ambassadors and statesmen from all over Europe. The city was besieged by German forces and was seat of the Belgian government. By great luck, he witnessed the first ever aerial bombardment of a city in wartime when a Zeppelin bombed Antwerp from the air on August 25th 1914. Not only did his dispatches scoop other newsmen, but in the excitement of the attack he also struck up acquaintance with the wife of Belgium’s Secretary of State, Mrs. Vandervelde who ultimately provided him with a formal laissez-passer allowing access to all military areas in Belgium. He made good use of his documents and traveled to the Belgian front lines and besieged fortifications to see first hand the early battles in Belgium and ultimately the dramatic fall of the city. Being an American and therefore a neutral, he was also allowed passage through the battlelines and visited with German generals. During the siege of Antwerp, he teamed up with another American journalist, photographer and cinematographer Donald Thompson from Kansas. Together they covered the siege from inside the city till the surrender and temporarily fulfilled the post of American consul during the bombardment. Powell and Thompson were among the few newsmen on hand to witness the German triumphal march through Antwerp. Immediately after the fall of Antwerp, he wrote ‘Fighting in Flanders’ (see links below) which was published in November 1914, barely a month after the fall of the city. It was an engrossing and adventurous account of this Allied setback, one of the war’s first best-sellers. His obvious pro Belgian stance in this book made him less than welcome in the German lines afterwards, but that did not seem to be a problem. 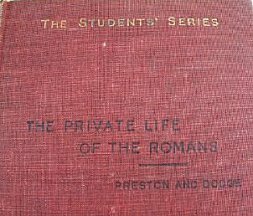 He kept up reporting on the war, mainly from France and later published two very successful war books called 'Vive la France' and 'Italy at War', which were both more or less collections of lengthy articles of his observations of conditions on various fronts.During later war years, Powell covered almost every part of the Western and Italian fronts. Unashamedly pro-Entente in his appreciation, he was allowed access to the front lines by both British, French and Italian commanders. 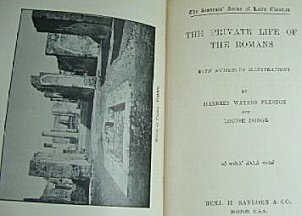 He produced very fine and detailed pieces on many aspects of the war, showing a somewhat eager appreciation for the Allied cause, but tempered with a typical American down-to-earthness, a fine eye for detail, description of landscape and mood and for contemporary writers, a more than usual caring about the trials and hardships faced by the common soldier. Upon American entry into the war in April 1917, Mr. Powell volunteered for military service and was commissioned as a captain in Military Intelligence. After several postings, he sustained spinal injuries in France falling off a horse and convalesced until after the Armistice. After the Great War, he continued his journalistic career as adventure writer by traveling far and abroad, writing numbers of books and articles. It would be hard to find an area of the world Mr. Powell didn’t visit during his lifetime : he went to Russian Central Asia, Indonesia, India, all over the Middle East, Ethiopia, Africa, Persia, the Soviet Union and even managed to enter Nepal at a time when the country was still closed to all foreigners. Though written more than half a century ago, his books remain eminently readable and engrossing. He writes clearly and precisely with little frill or pretension, but his descriptions of place and mood are very accessible , especially when he tempers his writing with a mild form of Yankee humor and light-heartedness. And yet for all his seemingly naive American hometown mannerisms he moved in the highest diplomatic and business circles of his time, friend and acquaintance to some of the 20th century’s most famous and infamous politicians and military men. His autobiography was published in 1954 and was very aptly called ‘Adventure Road’. Mr. Powell died in 1965. 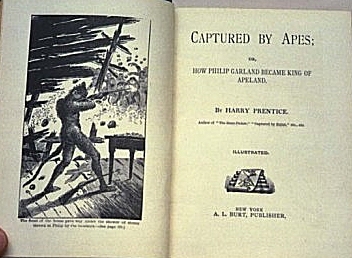 Captured by Apes or How Philip Garland became King of Apeland - 1892 NY: A L Burt ~ 286 p., illustrated. 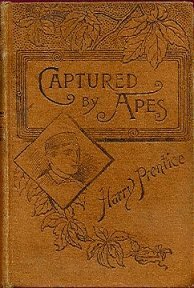 "In 1888 an author long since forgotten, Harry Prentice, produced a book called CAPTURED BY APES: or HOW PHILIP GARLAND BECAME KING OF APELAND. In it, Garland is shipwrecked... on an island... inhabited by simians." Later Prentice produced CAPTURED BY ZULUS (two white boys in Africa). Edgar Rice Burroughs, born in 1875, would have been just the right age to have read these books at 13-15 years old. 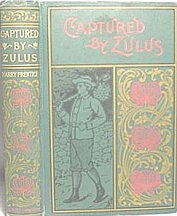 Could CAPTURED BY APES have influenced him to write TARZAN? And could the ZULU book have influenced the TARZAN TWINS? RICHARD ANTHONY PROCTOR (1837-1888), British astronomer, was born at Chelsea on the 23rd of March 1837. He was a delicate child, and, his father dying in r850, his mother attended herself to his education. On his health improving he was sent to King's College, London, from which he obtained a scholarship at St John's College, Cambridge. He graduated in 1860 as 23rd wrangler. His marriage while still an undergraduate probably accounted for his low place in the tripos. 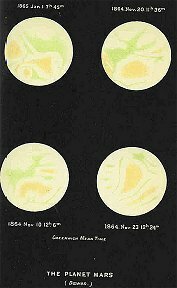 He then read for the bar, but turned to astronomy and authorship instead, and in 1865 published an article on the "Colours of Double Stars" in the Cornhill Magazine. His first book - Saturn and his System - was published in the same year, at his own expense. This work contains an elaborate account of the phenomena presented by the planet; but although favourably received by astronomers, it had no great sale. He intended to follow it up with similar treatises on Mars, Jupiter, sun, moon, comets and meteors, stars, and nebulae, and had in fact commenced a monograph on Mars, when the failure of a New Zealand bank deprived him of an independence which would have enabled him to carry out his scheme without anxiety as to its commercial success or failure. Being thus obliged to depend upon his writings for the support of his family, and having learned by the fate of his Saturn that the general public are not attracted by works requiring arduous study, he cultivated a more popular style. - He wrote for a number of periodicals; and although he has stated that he would at this time willingly have "turned to stone-breaking on the roads, or any other form of hard and honest but unscientific labour, if a modest competence had been offered" him in any such direction, he attained a high degree of popularity, and his numerous works had a wide influence in familiarizing the public with the main facts of astronomy. His earlier efforts were, however, not always successful. His Handbook of the Stars (1866) was refused by Messrs Longmans and Messrs Macmillan, but being privately printed, it sold fairly well. For his Half-Hours with the Telescope (1868), which eventually reached a 10th edition, he received originally 25 from Messrs Hardwick. Although teaching was uncongenial to him he took pupils in mathematics, and held for a time the position of mathematical coach for Woolwich and Sandhurst. His literary standing meantime improved, and he became a regular contributor to The Intellectual Observer, Chambers's Journal and the Popular Science Review. In 1870 appeared his Other Worlds than Ours, in which he discussed the question of the plurality of worlds in the light of. new facts. 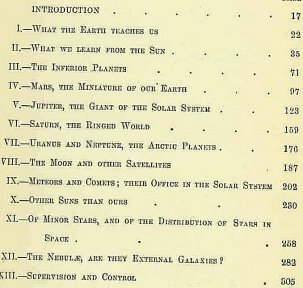 This was followed by a long series of popular treatises in rapid succession, amongst the more important of which are Light Science for Leisure Hours and The Sun (1871); The Orbs around Us and Essays on Astronomy (1872); The Expanse of Heaven, The Moon and The Borderland of Science (1873); The Universe and the Coming Transits and Transits of Venus (1874);(1874); Our Place among Infinities (1875); Myths and Marvels of Astronomy (1877); The Universe of Stars (1878); Flowers of the Sky (1879); The Peotry of Astronomy (1880); Easy Star Lessons and Familiar Science Studies (1882); Mysteries of Time and Space and The Great Pyramid (1883); The Universe of Suns (1884); The Seasons (1885); Other Suns than Ours and Half-Hours with the Stars (1887). In 1881 he founded Knowledge, a popular weekly magazine of science (converted into a monthly in 1885), which had a considerable circulation. In it he wrote on a great variety of subjects, including chess and whist. 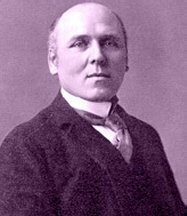 He was also the author of the articles on astronomy in the American Cyclopaedia and the ninth edition of the Encyclopaedia Britannica, and was well known as a popular lecturer on astronomy in England, America and Australia. Elected a fellow of the Royal Astronomical Society in 1866, he became honorary secretary in 1872, and contributed eighty-three separate papers to its Monthly Notices. Of these the more noteworthy dealt with the distribution of stars, starclusters and nebulae, and the construction of the sidereal universe. He was an expert in all that related to map-drawing, and published two star-atlases. A chart on an isographic projection, exhibiting all the stars contained in the Bonn Durchmusterung, was designed to show the laws according to which the stars down to the 9 - 10th magnitude are distributed over the northern heavens. His "Theoretical Considerations respecting the Corona" (Monthly Notices, xxxi. 184, 254) also deserve mention, as well as his discussions of the rotation of Mars, by which he deduced its period with a probable error of 0 9.005. He also vigorously criticized the official arrangements for observing the transits of Venus of 1874 and 1882. His largest and most ambitious work, Old and New Astronomy, unfortunately left unfinished at his death, was completed by A. Cowper Ranyard and published in 1892. He settled in America some time after his second marriage in 1881, and died at New York on the 12th of September 1888. See Monthly Notices, xlix. 164; Observatory, xi. 366; The Times, (Sept. 14, 1888); Knowledge (Oct. 1888, p. 265); Appleton's Annual Cyclopaedia, xiii. 707; Autobiographical Notes in New Science Review, i. 393. Howard Pyle (1853-1911) studied for three years with the Antwerp-school gold-medallist Van der Weilen. In 1876 Pyle moved to New York where he attended classes at the Art Student's League and produced illustrations for magazines such as Harper's Weekly and St. Nicholas. Pyle returned to Delaware in 1879 and began writing and illustrating his own books. 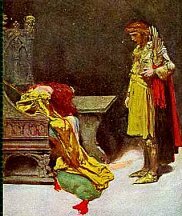 His illustrated adaptation of the Robin Hood legends, The Merry Adventures of Robin Hood (1883), is one of his best-known early works. Pyle continued writing and illustrating adventure books for much of his career, focusing on American colonial tales, Arthurian legends and adventure stories. In addition to illustrating his own books, Pyle also contributed to works by Oliver Wendell Holmes, William Dean Howells and Henry Van Dyke.At a time when it was customary to study art in Europe, Pyle strongly believed that students should seek training and inspiration in America. He began teaching classes, often for free, at the Drexel School of Arts and Sciences in Philadelphia and the Art Institute in Chicago. He attracted a large number of students, inspiring them with his idealism and the high standards he set. 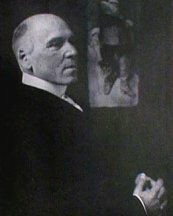 In 1900, Pyle resigned from Drexel and founded the Howard Pyle School of Art in Wilmington, Delaware. His students include many of the best-known American illustrators of the period: N.C. Wyeth, Harvey Dunn, Maxfield Parrish, Thornton Oakley, Elizabeth Shippen Green, Violet Oakley and Frank Schoonover. These artists and their students became known as the Brandywine School. They redefined how generations of children imagine piratesand princes, knights and knaves. Pyle retired from teaching in 1905, although he continued to lecture, illustrate, and advise former students. He traveled to Italy in 1910 to study murals, and died there in 1911. The Delaware Art Museum was founded to house his work and to this day remains the best source for viewing American illustrators.